From left: Jack Connell, Louise Connell, Paul Connell (dad) and Keith Connell and Louise’s friend Piper Tansley and then Imogen, Ivan and Caitlin Wu. This article was written by Jamie O’Brien and Mark Reidy and published in The Record. Several years ago, in his role as President of St Peter’s Parents and Friends Committee in Bedford, Ivan Wu was concerned by the distinct lack of male presence in the life of the school, so he set out to rectify the problem. “Other than the (male) teachers, I was the only male and father involved,” Mr Wu told theeRecord. “And, with an increasing number of decisions being made regarding the school and students’ lives, I believed it was important to get a broader perspective on issues. “So I understood straight away that an injection of male input was what the school community needed,” he said. In the latter half of 2013, Mr Wu organised a seminar specifically for fathers, which was soon followed by a visit from The Fathering Project, a non-profit organisation based at the University of WA which has recognised the dire emotional, social and economic consequences of a lack of father role models in Australian society. The Fathering Project aims to assist fathers and father figures in recognising the vital role they play in their children’s lives as well as assisting them in becoming more effective fathers and carers by providing information, strategies and advice. “I was surprised, but encouraged, by the turnout we had for the event,” Mr Wu shared. The instigation of The Fathering Project was a pivotal point in the school’s history as fathers soon started building new relationships with one another and a committee was then established to further cement a masculine identity into the school’s culture. “The five men who volunteered for the role are extremely passionate and have brought with them a great deal of wisdom and experience,” Mr Wu said. Events aimed specifically at fathers began in 2014 when 45 fathers turned out for a Year One school excursion to the WA Museum and Art Gallery. Following this was an enthusiastic response from the fathers of kindergarten-aged children to an invitation to spend time in the classroom, as well as numerous other opportunities for men to become intimately involved in the school life of their daughters and sons. This year, the school has aimed to further encourage male participation with an innovative project which has renamed the month of September to “DADember”, and has organised numerous opportunities for fathers and other important male role models to become more involved in their children’s lives. 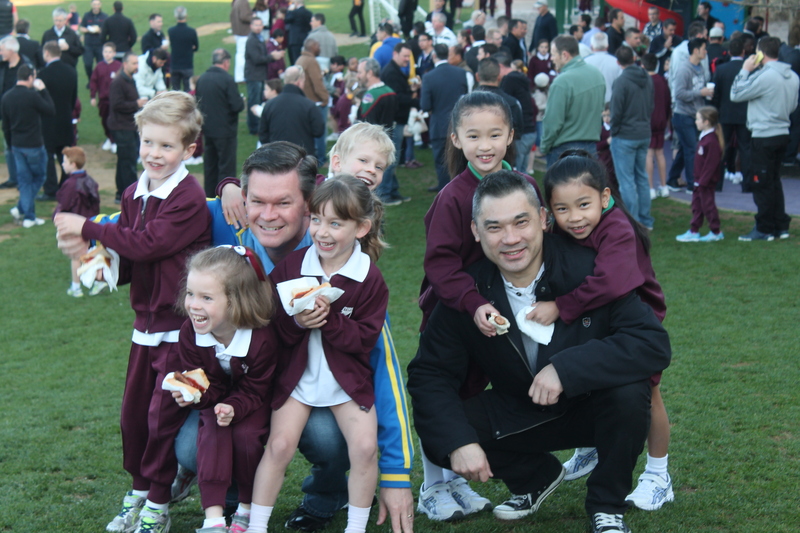 Every class in the school has opened the doors for fathers to participate in events, including school excursions, sports carnivals, class participation, games afternoons, cooking sessions and a father’s day breakfast. Speaking to the eRecord, Paul Connell, current President of St Peter’s Dads Committee, as the group is now known, was still puffing after just returning from a DADember activity with his sons and 13 other fathers. Mr Connell said he had been very pleased with how the concept had been embraced by the school and how the fathers were responding in such good numbers. “I have been really taken back by how supportive the Principal, Greg Ward, and all the staff have been,” he said.